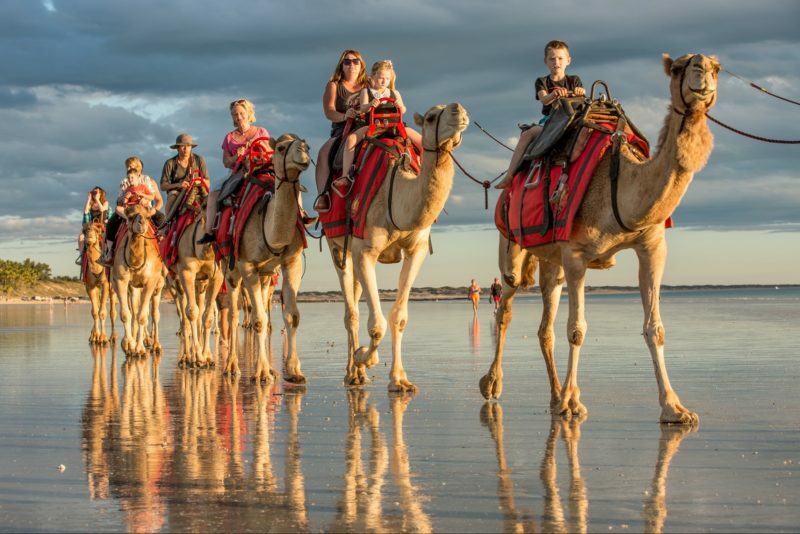 A wholly Western Australian-owned company operating with over nine years’ experience, ADAMS (and subsidiary ADAMS Pinnacle Tours) is proudly regarded as Western Australia’s leading tour operator. ADAMS is proud to provide Chinese visitors with a touring experience they can trust. They are the only Western-owned operator in Western Australia to have a dedicated Public Relations consultant in Hangzhou China and GSA based in Shanghai through a partnership with AAt Kings. An inaugural operator of the CRA programme, they offer Chinese translated website material, promotional collateral in simplified Chinese, two Chinese-speaking Day Tours, payment options through UnionPay, as well as Chinese speaking driver/guides. ADAMS are well-equipped to cater to the Chinese visitor allowing them to be able to enjoy the wonders Western Australia has to offer in comfort, style and assurance that all cultural needs have been considered. Known as one of Australia’s finest wine regions, the Margaret River region is an area blessed with natural beauty. Providing a diverse range of activities, this tour allows you to experience this high-profile Western Australian area in one day. The longest wooden jetty in the southern hemisphere can be found in Busselton, stretching 1.8 kilometres across the idyllic Geographe Bay. The first significant planting of vines in the region was in 1967, from there Margaret River has become regarded as one of Australia’s greatest wine producing regions. Indulge in a wine tasting. Take a guided tour through this gothic like cave with vast chambers full of amazing formations. The cave will reveal a fascinating range of information about the flora and fauna of this region. Drive through this beautiful forest region, home to the pale barked Karri Trees reaching up to 60 metres in height. This forest is a re-growth forest which is more than 100 years old and stretching several kilometres. Situated at the most south westerly tip of Australia is the Cape Leeuwin Lighthouse, where the Southern and Indian Oceans meet. Get away from the hustle and bustle of the city for a day to experience Swan Valley with the convenient Swan Valley Explorer Hop On/Hop Off service. Departing daily from Guildford Train Station, the Swan Valley Explorer travels around the valley, stopping at many of the regions’ famous wineries, breweries, distilleries and amazing eateries. Only a stone’s throw away from the city, Swan Valley is known for its fresh produce and rustic flair, making the region a must-visit when in Western Australia. The Swan Valley Explorer Hop On/Hop Off service gives you the chance to visit world-class wineries such as: Mandoon Estate, Sandalford and Houghton Wines; as well as gourmet produce factories such as: Mondo Nougat and Chocolate, The House of Honey and Meadery and The Cheese Barrel. The full Swan Valley Explorer loop takes approximately one and a half hours. Once you have had a fun-filled day in the valley, head back into Perth city via the Midland Line from Guildford Train Station. Please note that this service operates on a circuit departing and arriving at Guildford Train Station. Travel by public transport to Guildford Train Station is not included. Travelling through spectacular south-west forests and lush farmland, your day is topped off by a walk through the canopy of towering old-growth forest and visit to the culturally significant Kodja Place. This 51 metre tall Karri tree has been operating as a fire lookout for over 70 years, following its construction on 1940. If you are up for an adventure then you can try and climb this tree, making your way up along the metal spikes in the side of the tree. The breathtaking views from the top of the lookout are worth the climb. Get up close and personal with these 400 year old giants of the south west tingle forest region. Walk through the treetop canopy, along the gradually elevated walkway, suitable for all ages. The highest point of the 600 metre loop is about 40 metres. View the stunning coastal scenery and windswept rocky shores, famous at William Bay. Rich in cultural history the Kodja Place Visitor Centre features an informative display of insight in to traditional Noongar history of the area and life of the tight knit community. Walk among some of the tallest and oldest trees in the world, discover an ancient underground world and enjoy breath-taking ocean views. The South West’s rugged wilderness and gourmet reputation come alive on this tour. See an Australian sheep dog and shearing demonstration. Take some free time to explore the quaint shops featuring the work of local craftspeople, chic cafés and speciality stores. Visit this 1890s lighthouse, built from local limestone on the most south-westerly tip of Australia, where the Southern and Indian oceans meet. A guided tour of this 500 metre-long, 30 metre-deep gothic cave structure featuring impressive structures, fossils and the remains of the extraordinary megafauna (giant mammals). Get a bird’s eye view 40 metres above the forest floor from a lightweight bridge among the tingle trees, and bask in a grove of 400-year-old tingle trees on the Ancient Empire Walk. Take a luncheon cruise with a local guide on Nornalup Inlet, known for its diverse marine environment. See the world-class historical attractions. Drive through this 100-year-old regrowth forest, home to the third tallest tree in the world, the karri tree. Get a bird’s eye view 40 metres above the forest floor from a lightweight bridge among the tingle trees and bask in a grove of 400-year-old tingle trees on the Ancient Empire Walk. This towering 61-metre karri tree was once used as a fire look-out and has been climbed by more than one million people – will you take the opportunity to climb it? Take a luncheon cruise with a local guide on the Nornalup Inlet, known for its rich, diverse marine environment. This fabulous day out explores the world-renowned Pinnacles Desert. Other highlights include off-road driving, sand boarding, feeding kangaroos, photographing koalas and wildflowers (seasonal). Featuring over 200 species of animals in a walk-through environment this park is a must visit in Western Australia. Animals include friendly koalas, wombats and numerous kangaroos. Take a tour of a live lobster processing plant. A video presentation gives you an insight into this marvellous industry. Follow on through to the factory overhead walkway where you stand directly above 20 tones of live rock lobster. 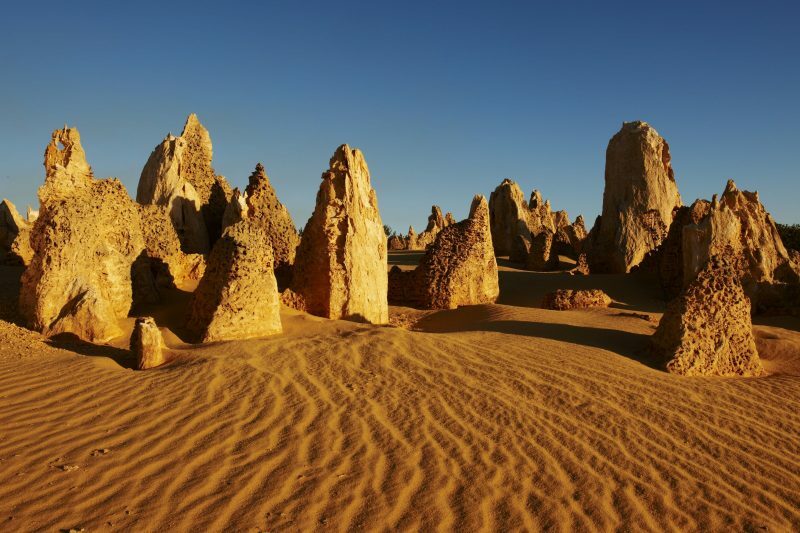 Take a stroll through this eerie desert, amongst the iconic Pinnacles, believed to have been created millions of years ago when seashells were broken down into sand and then eroded by water and wind. Western Australia’s gateway town to the Pinnacles Desert, Cervantes is a laid back fishing town north of Perth. Be sure to take in the lobster fishing industry as you travel through this town. 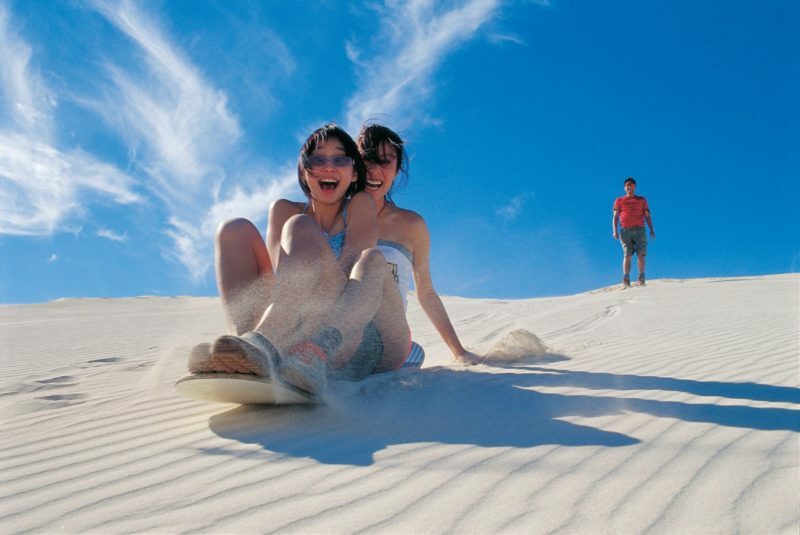 Thrill to the adventure of four-wheel-driving over massive white sand dunes, the biggest in Western Australia. For those wanting more adventure, your adrenalin will be pumping as you sand board down these massive dunes. With Optional River Cruise; A fantastic tour taking in Perth and Fremantle, the city and the alfresco lifestyle that Perth people enjoy. Walk through the tree canopies on the Tree Top Walkway. 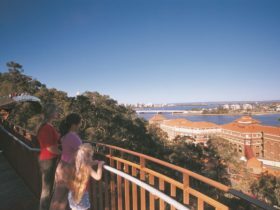 See views of the Perth city skyline and the 750-year-old boab tree. See the WACA, Bell tower, Perth town hall and St Georges Terrace. View this famous coastline as you travel to Fremantle. Visit the historical port situated on the mouth of the Swan River and find a bargain at the markets (Friday, Saturday, Sunday only). There’s an option to cruise back along the Swan River from Fremantle. Luxury coach travel. Expert commentary. Tour concludes at Barrack Street Jetty, there is no hotel drop-off available. Journey through the Western Australian wheatbelt to Wave Rock, one of Australia’s most incredible natural monuments. Visit the historic township of York and view other significant formations of the area. 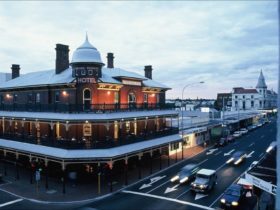 Situated in the Avon Valley, York is one of Western Australia’s most picturesque towns with charming architecture. This town was the first inland European settlement in Western Australia, founded back in 1831. Another rocky outcrop in the area, named because of its resemblance of a hippopotamus yawning. East of Perth you will find Wave Rock, a giant surf like landform of multicoloured granite, appearing as if it’s about to crash in to the ground below. Wave Rock is more than 2,700 million years old. If time permits wander through the wildlife park where you can enjoy time seeing kangaroos, emus, wallabies, wombats, koalas, lizards and a wide range of birds. September to October, seasonal only: Enjoy a relaxing day taking in the spring wildflowers. The exact itinerary will be unknown until the day of departure to ensure you view areas with the most abundant wildflowers. An expert guide will help you to identify rare and delicate wildflowers. You will have ample time to take photographs and immerse yourself in the beauty. See a wide variety of wildflowers including renowned Everlastings, Orchids, Red and Green Kangaroo Paw, Banksias, Bottle Brush and Western Australia’s famous orange Christmas Tree. Receive a complimentary take-home copy to recall the amazing Western Australian Wildflowers. Luxury coach travel, lunch, expert commentary, wildflower booklet and entry fees. Profusion of wildflowers depends on weather and other conditions, therefore Adams Pinnacle Tours cannot guarantee sightings. Wear comfortable walking shoes, bring a hat and your camera. 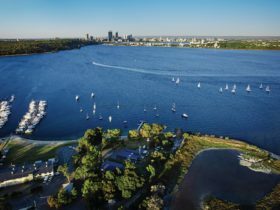 Embracing either side of the beautiful Swan River Estuary it’s a city to enjoy in all seasons. This tour is a great way to get your bearings around Perth and gives you a great insight into the city and the alfresco lifestyle that Perth people enjoy. 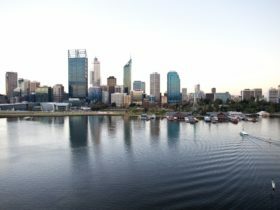 See Western Australia’s rejuvenated Capital City. View stunning flowers and spectacular views. Enjoy a historic trolley tram ride and free time for shopping or lunch. Cruise back to Perth on a scenic river cruise. An exciting day out exploring the iconic Sorrento Quay Hillarys Boat Harbour, the Lancelin Sand Dunes and the mystical Pinnacle Desert. Explore the stunning Marina and take the opportunity to shop for souvenirs. Covering 17,491 hectares and home to the Pinnacles. View and walk through the amazing moonlike sandscape. Enjoy a thrilling downhill sand board adventure. Have a fascinating day out combining the history of Australia’s only Benedictine Abbey with the world renowned Swan Valley wine and local produce region. Visit Australia’s only Benedictine town. Home of one of the only two large Moser organs. Visit the closest wine region to any capital city in Australia. Sample some of Swan Valley’s iconic produce. Indulge in a personalised Australian afternoon tea. Additional stops will be made during wildflower season to view Western Australia’s amazing flora. A fascinating day out combining the history of one of Australia’s Benedictine abbeys with the world-renowned mystical Pinnacles Desert. A little piece of Spain comes alive in this town, full of history, art and architecture. The town’s main attraction is the museum and art gallery. The Abbey Church is home to one of only two large Moser organs. Originally crafted in Germany, this organ was imported to Australia in the 1920s. Visit St Gertrude’s College, a grand gothic style building which was originally built as a girls boarding school and opened in 1908. Home to the iconic Pinnacles Desert, Nambung National Park features an array of coastal dunes. These mystical limestone pillars make up one of Australia’s most unique landscapes, rising eerily out of the sand and reaching up to several metres tall. Stop to view wildflowers throughout the tour whilst they are in season. Varieties include the orange flowering Christmas Tree, Kangaroo Paw, Banksia, Wattle and Everlastings. Luxury coach travel, lunch, expert commentary and entry fees. The Margaret River Wine Region offers a superb blend of indulgent experiences and stunning nature. This tour will suit all wine enthusiasts, offering an afternoon of wine tasting whilst still enjoying the diversity of sightseeing and other attractions. Boranup Forest – Drive through the impressive Karri Tree forest. Local produce – Sample beer, wine and cider. Margaret River Township – Walk the main street. Sample dozens of local gourmet foods. guided tour through their stunning vineyards. Experience Australia’s best chocolate made fresh by a true craftsmen. Begin your journey through the Wheatbelt Region of Western Australia to Wave Rock, one of Australia’s incredible natural monuments. Visit the historic township of York and view other significant geological formations of the area. Learn about the grand old pioneer days in the first township founded in the Avon Valley. Hear the legend of Mulka and view imprints of his hands in the cave. View the tribute to Australian working sheep dogs. Take in the unusual rock formations. Learn about dreamtime stories and discover Aboriginal sacred sites including Gnamma Holes. View the stunning wildflowers of Western Australia during September to October. Travelling through spectacular South West forests and lush farmlands your day is topped off by a walk through the canopy of towering old growth forest. Experience the modern marvel and interactive experience to connect with the ANZAC history. Learn all about the history of Australia’s oldest whaling station. A 400-metre long Tree Top walk. Walk amongst the Tingle Trees. View the stunning coastal scenery. Learn about the spirit of life in ‘the bush’. A great afternoon tour taking in the highlights of Broome, providing an insight into the heritage of this charming town and colourful alfresco lifestyle. Discover the mixture of colonial and Asian architecture. The world’s oldest operating picture gardens. An award-winning microbrewery recognised as a true Broome treasure. Highlights the close ties Japan established with Broome and its pearling industry. The largest deep-water access port servicing the Kimberley region. A stretch of white sandy beach overlooking the blue waters of the Indian Ocean. A day experiencing inland Kimberley. Three of the Kimberley’s well known icons, the Prison Boab Tree, Windjana Gorge and Tunnel Creek leave you with a great insight into this fascinating part of outback Australia. Known to West Australian’s as ‘The Mighty Fitzroy’. See one of the region’s most iconic landmarks. One of the longest troughs in the southern hemisphere. Travel along a 660-kilometre track that runs through the heart of the Kimberley. View one of the region’s most breathtaking gorges. Visit part of Western Australia’s oldest cave systems. Journey to the tip of the Dampier Peninsula to experience the remote coastal wilderness area of Cape Leveque and local Aboriginal Communities. Located on the western side of the Dampier Peninsula and established around the 1980s. See the Pearl Shell Altar located at the famous Sacred Heart Church built in 1918. Visit a renowned pearl farm situated at the tip of the Dampier Peninsula. Travel to the northernmost tip of the Dampier Peninsula approximately 240 kilometres north of Broome. Enjoy a two hour sea safari on the Buccaneer Archipelago famed for enormous tidal rush, standing waves and intense whirlpools. Visit spectacular Rottnest Island, the “Emerald Isle in a Sea of Sapphire”, only 19 kilometres off the mainland coast, “Rotto” has a relaxed atmosphere and unique features that will leave a lasting impression. The stunning and pristine environment, 63 secluded beaches and 20 bays, crystal clear water, fascinating and colourful history, Quokkas and all the “Colours of Rottnest” will be fully appreciated on the Grand Island Tour. Visit the shipwreck and learn about the maritime history of the stunning Rottnest Island. Take a selfie with a quokka! Dubbed the “happiest animal on Earth”. See the stunning bays and beaches. View Western Australia’s first stone lighthouse and learn about the rich Noongar history. Enjoy a guided tour of the Oliver Hill Guns and Tunnels. Visit spectacular Rottnest Island, the “Emerald Isle in a Sea of Sapphire”, only 19 kilometres off the mainland coast, “Rotto” has a relaxed atmosphere and unique features that will leave a lasting impression. The stunning, pristine environment includes 63 secluded beaches, 20 bays, crystal clear water, fascinating history, the Quokka and more. All the “Colours of Rottnest” can only be fully appreciated on the fully commentated Bayseeker Tour. Take in the sights and of the boardwalk and see the fauna on Rottnest Island. Explore the world-renowned Pinnacle Desert, an amazing moon-like landscape, at the most magical time in the evening. Experience the change in light as the sun sets and makes way for a myriad of stars brought to life without light pollution. Stop to see the koalas, which has been home to a colony of koalas since 1938. View one of Australia’s most iconic species from the raised boardwalk. Visit the magical Pinnacle Desert in the late afternoon to avoid crowds and see the breathtaking sunsets through the mystical limestone rock formations. See the night sky and amazing stars without light pollution. See the stunning Western Australian coastline along the colour-filled Indian Ocean Drive. Known as one of the Venice of Western Australia, the Mandurah and Peel region is famous for its stunning natural beauty and abundance of marine wildlife, notably home to Western Australia’s largest dolphin population inhabiting the Mandurah canal network. Experience all the wonders of the relaxed coastal tour of Mandurah and the stunning Peel region on an easy paced day tour. Experience a close up and personal dolphin cruise experience with Mandurah Cruises. Hop on board the 1400hp safari vessel, the Spirit of Adventure for an amazing one-and-a-half hour Mandurah dolphin tour. Visit the over 2,000 year old thrombolite reef at Lake Clifton. Over 6 kilometres long and up to 120 metres wide, the thrombolites are the largest in the Southern Hemisphere. 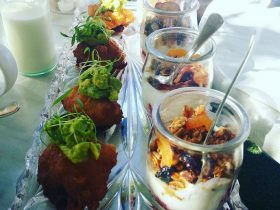 Enjoy morning tea in the Cape Bouvard area. Spend some free time after lunch for souvenir hunting and shopping at the iconic Mandurah Boardwalk before travelling back to Perth. Busselton Jetty– See the longest jetty in the Southern Hemisphere. Cape Leeuwin Lighthouse – The meeting of two oceans. Tastings at a minimum of three boutique wineries. Visit three gourmet food producers including cheese and chocolate. 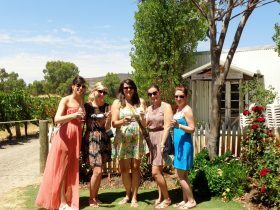 guided tour through their stunning vineyards or cellar door. Experience stunning views of the Margaret River region coastline.